Thanksgiving is a day when Americans (and Canadians!) gather and give thanks, and with this free embroidery pattern, you can stitch that idea, along with a basket of flowers and harvest bounty. But you don't have to wait until Thanksgiving to enjoy this pattern, because it's a message and design that's perfect for the entire autumn season! Gather and Give Thanks, would make a beautiful pillow or the center of a quilt. It would also look great on a kitchen towel if you shrink it down slightly. Of course, framing it either in a hoop or a standard frame is a classic option and one that you can display for your fall decor. This pattern uses simple stitches that should be familiar even to beginners, which makes it an enjoyable project for anyone. If you're a more advanced stitcher, you can add more detail or work in some fill stitching. Linen or other embroidery fabric - A dark shade like in the example has a wonderful autumn feeling to it, but white or tan linen also works if you adjust a few of the thread colors. 10-inch embroidery hoop - Using a large hoop prevents the need to move your hoop around, which can flatten stitches. Embroidery floss - Use colors you like or gather the colors listed in the color and stitch guide below. Download the full-size JPG pattern, re-sizing if you choose, and print it out. Printed at 100%, the design fits comfortably within a 10-inch hoop. Use your favorite transfer method to mark the design on your fabric. If you are using dark fabric like in the example, either light-colored transfer paper or water-soluble stabilizer will work best. Choose a palette of embroidery floss that has a warm, harvest feeling to it and that works well on the fabric you're using. The colors shown here may not show up as well on a lighter background. To stitch your Gather and Give Thanks embroidery with the colors in the example, use DMC 703, 725, 922, 815, 3688, 3835, 739, 422 and 840. Work the entire design with three strands of embroidery floss. Embroider the sunflowers with fly stitch for the petals, back stitch to outline the centers and french knots in the center. You can improvise with the placement and number of the french knots, or even fill in the entire centers! Use back stitch for the stems and leaves. Stitch the tiny looped flowers with detached chain stitch, working the stem with either back stitch or stem stitch. Embroider the pumpkins with stem stitch for the pumpkin itself and back stitch for the stem. Work the bushel basket with back stitch. 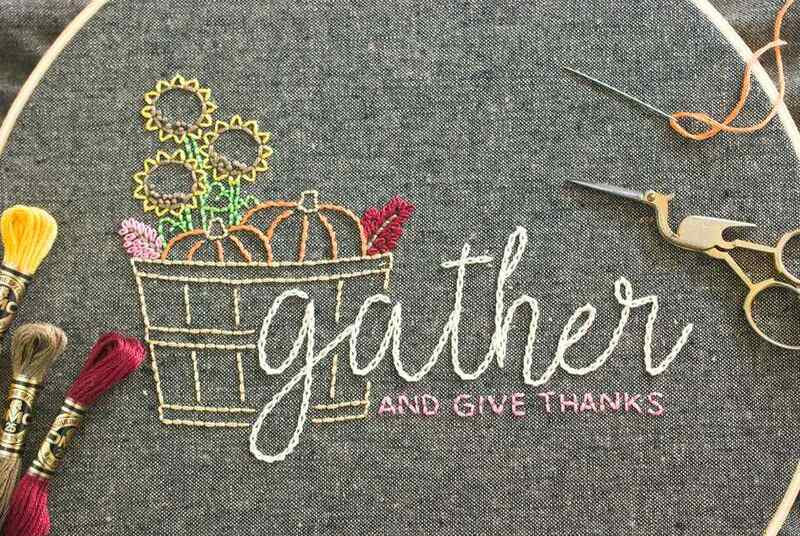 Use chain stitch for the word "gather" and back stitch for "and give thanks". These stitches are a suggestion based on the example, but you can swap out any for those that you prefer.